The Golden Age of Piracy is a time when men turn their hands against each other and the seas and coasts are splattered with blood. The wars that ravaged Europe are over, but peace brings new problems. Thousands have been displaced or orphaned, their homes and lands ruined, or claimed by others. Many thousands more see their livelihoods as soldiers and sailors disappear as Europe's armies and navies are reduced in size. National resources are free to invest in exploration, colonisation and trade. Mercantilism is on the rise and the great ports of Europe are flooded with wealth drawn from the far East and the West Indies. Spain holds most of the New World in her grasp, extracting fabulous amounts of gold and silver. Plantations on Cuba, Hispaniola, Barbados and other islands turn a tidy profit. From approximately 1655 until the early 1730s the world sees the largest surge in acts of piracy in recorded history. It is this inspiring era that gives us Henry Morgan, Blackbeard, Kidd, the Isle of Tortuga, Port Royal, Anne Bonny and Mary Reade. 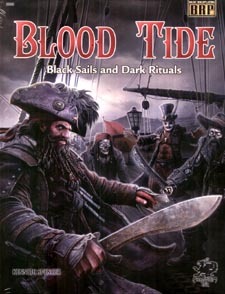 This is the era of Blood Tide!